Hill Country ENT (New Braunfels) - Book Appointment Online! 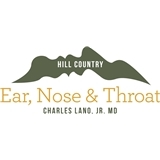 At Hill Country Ear, Nose & Throat, we are dedicated to providing the highest quality of care possible for patients of all ages. Dr. Lano's practice includes the treatment of adult and pediatric patients with a variety of diseases of the ear, nose & throat. Dr Lano was very informative. Made me feel comfortable and understood what needed to be done to fix the problem. Did a great job on the surgery. Was much better than I was expecting. Dr Lano gets my vote for Dr of the year and I would not hesitate to recommend him to anyone needing this type of service.